Who knew birds and monsters could be friends? 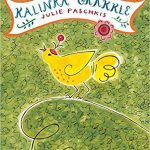 Apparently, Kalinka knew. She does her best to help neighbor Grakkle clean his house, though it’s pretty clear he doesn’t want her help. He just wants to relax and soak his feet in pickle juice. She flits around, tidying as she goes, until Grakkle accidentally knocks her into the pickle juice. He obviously feels bad and does his best to revive her and clean her up. They can always enjoy a nap together. Adorable action-packed illustrations accompany this unusual yet familiar story of the ultimate odd couple. Grakkle is especially expressive. The house is obviously a mess, but what’s a moster to do? Relaxing is important too.